Paris is a quintessential place to visit in Europe. It's a beautiful city with a lot to offer travelers in the form of museums, history, architecture and cuisine. There are countless hostels spread throughout the city that backpackers can choose from. While some visitors prefer to stay at a more off the beaten path facility, others prefer the reputation and social atmosphere of one of the more popular hostels around the city. Below is a list of some of the most popular hostels in Paris. A good hostel for couples and female travellers. This hostel is a favorite for travelers who want to stay in the Montmartre Village area. It's near many different bars, cafes, bistros and pubs, but the rest of the city is also easily accessible by metro. The hostel has a modern and fun design that has a lot of color and an eclectic atmosphere. Each room has a private bathroom and the doubles all have flat screen televisions. Other amenities available to guests include wi-fi access, free breakfast, a kitchen, a luggage area, free tours of the city, and more. You can choose between three, four, five, and six bed dorms. There are also private rooms available for those who want more personal space. This is a great place to stay if you're looking to meet other travelers and have a great time in one of the most fun neighborhoods in Paris. A good hostel for female travellers, groups of friends, and couples. This hostel is a social setting that offers guests everything from live music and great parties to comfortable beds and free wi-fi. They offer unique facilities such as female only floors, the popular Belusi's Bar, and regular events. The social environment has made this hostel one of the most popular in Paris. You're sure to make a good group of friends during your time here. The hostel is located near public transportation so many of the most popular sights are just a short metro ride away. 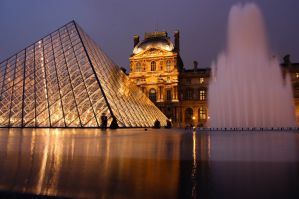 These include the Louvre and the Latin Quarter. This is a great place to base yourself to see the entire city. An affordable hostel in a central location. This popular hostel is a favorite among budget travelers. It's located conveniently right in front of the canal St Martin. It's only a five minute walk from Republique and a ten minute walk from the Opera as well as Bastille and the Marais. It's about fifteen minutes from Montmartre and twenty minutes from the famous Eiffel Tower. Guests can choose between a variety of rooms including singles, doubles, triples and dorms, so there is really something available for all traveler types and budget ranges. Amenities available to guests include free internet access, breakfast, and free travel information. The hostel is in the trendy Metro Republique district which is near a lot of restaurants, cafes and pubs. It's the perfect place to base yourself during your time in Paris. This hostel is conveniently located only a block from the Paris North train station. It's a great place to base yourself while you explore this beautiful city. Although many neighborhoods, sights, and attractions are within walking distance, it's also very close to the metro so you can reach outlying neighborhoods easily as well. The staff are very welcoming and friendly and you're sure to have a good time meeting other guests and travelers. This place truly has that "home away from home" feel. Don't hesitate to ask if you have any travel related questions. Included in the price of the room is internet access, air conditioning, a map of the city, and a continental buffet breakfast. There are many restaurants and pubs nearby as well as a laundry mat and supermarket. This hostel is located just a few blocks from the Sacre Coeur, but it still has a peaceful and quiet setting. The lobby has been recently redesigned and the atmosphere is very welcoming. From the hostel you can walk to the Clignacourt Flea Market, the Art-Naif Museum, and many of the area's most popular bars and restaurants. The area has an eclectic artists vibe and it's a fun and interesting place to base yourself. The staff is available to answer any questions you may have and they are very familiar with the neighborhood and city so can help you decide where to go and what to see. Included in the price of your room are a breakfast and access to a kitchen. There's also free luggage storage, internet access and travel information available. Located right in the middle of Paris conveniently close to public transportation, this hostel is a great option for those traveling on a budget. It's just a short walk from the Latin Quarter where there is plenty to see and do. It has a vibrant and fun atmosphere and the staff work hard to help you feel welcome. The rooms are kept very clean and most sleep four people. Within walking distance you'll find many great restaurants and entertainment options. Perks available to guests include free wi-fi service, 24 hour reception service, free travel information, luggage storage, free breakfast, and air conditioning. This hostel is conveniently located near public transportation and is a perfect place to base yourself while you explore Paris. The hostel offers both dorms and private rooms for those on tight budgets. The hostel offers an excellent view of Sacre Coeur and is very close to Gare Du Nord, Montmartre, Pigalle, and much more. It's also in easy walking distance of restaurants, pubs, nightclubs, and markets. The staff are wonderful and well informed on the area. They work hard to make sure your visit is memorable. There are a total of 60 rooms available that are quite diverse, so the hostel appeals to an eclectic group. There are also laundry facilities available as well as televisions, internet, and breakfast. This hostel is a perfect budget option for all types of travelers. They offers rooms that are everything from single to six person dorms. Every room has a bathroom, telephone, and shower. There's also a common room, kitchen, cafe, and more. The location is convenient. Every weekend there is a nearby flea market. There's also a supermarket next door for those who hope to prepare their own meals. The hostel is in the neighborhood known as Montmartre. This is a popular neighborhood with artists and poets. It's also conveniently near many different restaurants and attractions.